Not a day goes by when I can avoid thinking about UI and UX. Sometimes, I’m thinking about real-world scenarios, but as a developer, I also have to consider it in the applications that I build. As developers, we really cannot avoid it, even when there’s someone else in charge of the UI/UX of the application we’re building. Thanks to Mark Miller’s DevIQ course, The Science of Great UI, I’ve been able to learn a lot more about UI and UX. It’s an in-depth course which really does focus on the science behind building good user interfaces. It’s not just a prescriptive, do X, Y, Z in this certain scenario, the course explains the science that’s dictating what makes a user interface good or bad. I learned a ton from this course! As some of you may know, a few close friends of mine and I created a training company called DevIQ. We’re all passionate about technology and improving how people learn; we’re frequent speakers at conferences, run training workshops, and mentor other technology experts. As we create new courses, we’ll be posting them to DevIQ.com, so be on the lookout for more great courses all the time! So once you’ve watched this course, you’ll be in the same boat that I’m in, waiting for Mark to produce the follow-up course Design Like a Pro. He’s doing a series of courses on design that will help you and me become better at designing great user interfaces. 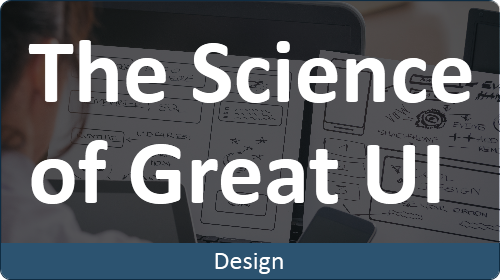 Go check out Mark’s course, The Science of Great UI!